If there’s one subject that occupies my brain more than almost any other, it’s pack organization. Not because I enjoy sitting around thinking about whether my flashlight is better off in the lid of my pack vs. being buried somewhere deep inside, but because I’m a little neurotic when it comes to organization in the first place. There were frequent tornado sightings in my room when I was a kid (I was informed that this was the only explanation for the condition of my living space), so I’m not sure at what point this neurosis emerged. Somewhere along the way I became a bit of a neat freak and I never looked back. My condition has evolved fairly naturally over the years without creating too many challenges in my day-to-day life, but for backpacking it’s presented something of a Rubik’s Cube. Only recently have I become satisfied with the way I pack my pack, and what a relief it’s been. Far and away the biggest mistake I made was subscribing to the idea that the more I segregated my gear, the more organized and efficient I was. This works well in a general living space where piling a bunch of stuff together makes it harder to keep things straight, but I’ve come to realize that less is definitely more when it comes to pack organization. And by less, not only do I mean having fewer things to organize, but also having fewer things to keep those things organized. Everything comes with its own stuff sack these days: jackets, sleeping bags, air pads, even pack towels. Of course, the natural tendency is to pack each thing in its own stuff sack. This is mistake #1. In fact, the first thing you should do when you get a new piece of gear is to take the included stuff sack and throw it into a pile with the others. Having more stuff sacks doesn’t just add weight, it actually complicates organization and reduces efficiency. First, crunching each individual item down to its smallest form is a time consuming process. Second, it creates awkward gaps inside your pack that end up wasting space, not saving it. This isn’t as big of a deal on shorter trips but when you start going on lengthier hikes, repacking everything into its own stuff sack day in and day out gets old fast. Top: TarpTent Notch fly. Left to right: Mountain Hardwear Phanton 45 sleeping bag, Mountain Laurel Designs SuperLight Bivy, Exped SynMat UL7, Arc’Teryx Cerium SL Jacket, Arc’Teryx Atom LT pants, Montbell Versalite pants, sleep clothes in a Sea-to-Summit Ultra Sil dry sack, Exped Air Pillow UL. Each of those items (except for the sleep clothes) either comes with its own stuff sack or packs into its own pocket. If I pack all of those things down individually and put the sleep clothes in a separate stuff sack, I’ve got 6 nylon bricks. Since I don’t have a need for any of those items during the day, they’ll wind up in the bottom of my pack anyway… which means 6 things that I need to put into my pack, 6 things I need to take out later, 6 things I need to decompress, 6 things I need to re-compress, 6 things I need to put back into my pack, etc. Since those items are all compressible on their own, why not just compress them all together? 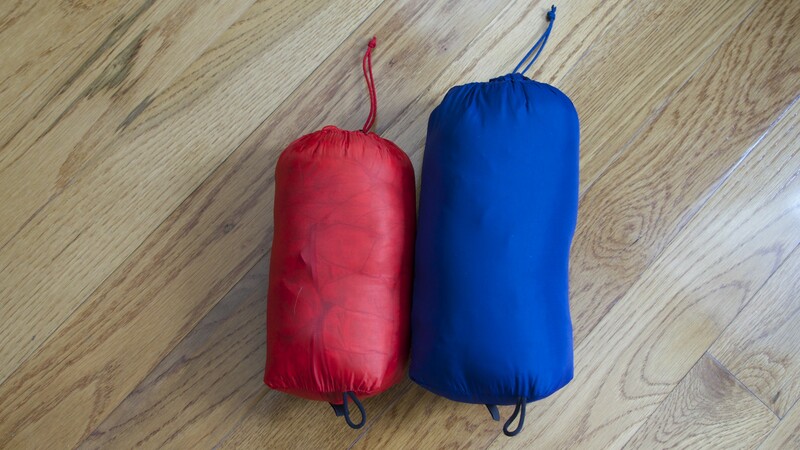 Not only does this save a lot of time when packing and repacking, but it’s a much more efficient use of space since there are no voids between each item.² Tents and tarps fall into this category as well; they can be stuffed loosely inside your pack without using their original (or any) stuff sacks. What if you have a wet tent? You can still store it inside of your pack since the pack liner (mentioned above) should be waterproof on its own. Just stuff the tent on the inside of your pack but outside of the pack liner. Also, if you have a large external mesh pocket that isn’t full of other things, you can use it to store a wet shelter temporarily until you find a place to dry it out. All of the aforementioned items (minus the rain pants, which need to remain accessible) without their original stuff sacks. This could easily be made smaller but it isn’t necessary. Not only is compressing things down to their absolute minimum not worth the time, but doing so can actually make it harder to stuff things into your pack. Another challenge is how to quickly and easily get to the things you might need during the day without having to dig for them. You can store these items on the outside of your pack (external pockets, lid, etc. ), but this is sometimes easier said than done. The trick is to find a way to do it without turning your pack into a bulging mess. Tip #1 for accomplishing this: take less stuff. It sounds obvious, but you’ll be amazed how much easier it is to organize your pack when you have fewer things to organize. Tip #2: use a stuff sack to organize these items but be careful about which one you choose. For example, roll-top versions like the Sea-to-Summit Ultra-Sil stuff sacks may initially seem like a good idea, but they can be a hassle when trying to get to frequently used items. I’ve also found that “round” stuff sacks don’t work as well in external pockets (especially stretch mesh) because they create excessive bulges that make it difficult to get things in and out of these pockets. I prefer to use “flat” sacks for smaller things (toiletries, miscellaneous items, etc.) because they fit more easily into external spaces and are easier to manage. Eagle Creek Pack-It Sacs aren’t waterproof, but a zipper makes for easier access than a roll-top bag. They also work well for keeping several small Ziploc bags organized and protected from wear and tear, so the enclosing bag doesn’t actually need to be waterproof. They’re a little pricey but seem to last as long as you’re careful with them. There are usually cheaper alternatives in most travel sections, just be mindful of the weight of the material. Admittedly, one of my big motivations for finding ways to store gear on the outside of my pack has to do with the accessibility (or lack thereof) of my particular pack, which not only has a lid but a roll top closure as well. There are many options for packs these days that cut down on external pockets and ditch the lid too (to save weight and bulk), so storing things on the inside of your pack may be easier (and necessary) depending on your particular model. Getting back to the inside of the pack, there are 2 methods I use for storing the items I mentioned earlier: the Exped Schnozzel Pumpbag or a generic trash compactor bag. Trash compactor bags are cheap and widely available at most grocery stores. They’re also much more durable than regular trash bags, which stretch and tear easily. A single box can last several years if you’re hiking mostly on weekends and occasionally venturing out for a week long trip. In fact, this would be my preferred method were it not for one factor… I tend to use Exped pads and the Schnozzel can be used to inflate them. If you’re not using an Exped pad, there’s really no advantage to using the pumpbag over a trash compactor bag for storage. In fact, there’s really no reason to use any expensive pack liner unless it serves multiple purposes. A standard trash compactor bag (left) and the Exped Schnozzel Pumpbag (right). While we’re on the subject of pack liners, I recommend using one as your primary method for keeping your gear dry. The traditional approach of using a pack cover is inefficient and actually presents several vulnerabilities. A pack cover won’t do much if you fall or drop your pack into a river or stream since there’s a giant hole on one side. Also, if you’re hiking in a steady, all-day rain storm, chances are you’ll need to access something underneath of the pack cover at some point while it’s still raining. Each time you do this, you let in water that has no chance of escaping since you’re covering it back up. These little bits of moisture will eventually soak into the gear on the inside of your pack since most modern packs don’t actually retain that much moisture themselves. Basically, you need a pack liner anyway, and there’s little sense in having both, so ditching the pack cover saves weight and eliminates the inconvenience of having to take it off and put it back on each time you need to get something. The main consideration you need to account for (especially if you’re used to having a pack cover and you’re thinking about ditching it) is whether you have things in your external pockets that shouldn’t get wet. This is another important aspect of pack organization: being aware of where things are and what problems that may present. 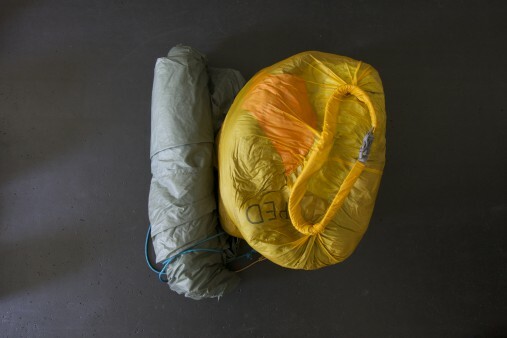 You might argue that pack covers eliminate the need to worry about such things; I would argue that thinking about such things allows you to pack lighter and more efficiently. Another topic that traditional articles on pack organization like to discuss is the idea of loading things a certain way to keep your pack balanced. For example, putting all of your heavy items on one side of the pack and all of the lighter items on the other side can lead to discomfort and even injury. While I believe this is something to be mindful of to some degree, I don’t consider it to be very relevant if you’re following the general advice here on making your pack lighter. Other than water, there isn’t really anything you need that will significantly alter the balance of your pack on its own. If you’re already packing light to begin with, this usually won’t be an issue. ¹ I realize that this particular list might seem overkill for the conditions I described. It’s not meant to be representative of what you should take for these conditions. I get cold very easily when idle, so the insulated pants and sleep clothes are sometimes necessary outside of pure winter conditions. Other people may find these items to be unnecessary. 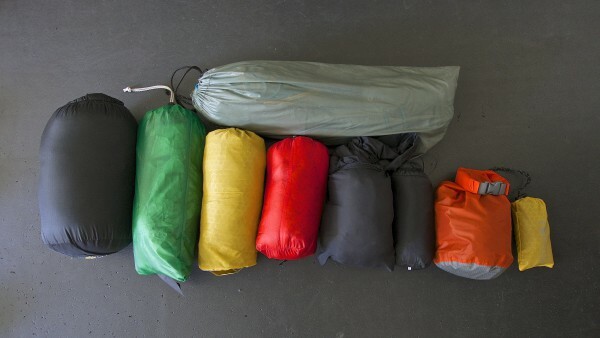 ² Another tip: throw most (or all) of these items inside your sleeping bag first and then stuff it. That way you don’t have a gear explosion later when you try to pull one item out and everything else comes with it.